Don’t worry; we’re not judging! It’s hard enough to get the holiday season in order with travel plans, visiting family, and finding things for the kids to do during their time away from school. If you forgot a gift for someone, you’re not out of luck. Here are some quick yet thoughtful gift ideas that no one will ever suspect were last-minute. Bonus: they’re all wallet-friendly! Hot cocoa is the drink of choice during the holidays, but that’s no reason to forget about your friend’s favorite cold beverage. Grab a multi-pack of their favorite 12 oz. canned or bottled soda and some martial arts-themed Can Coolers to go along with them. The drinks may only last a few weeks, depending on how quickly they go through pop, but the can coolers are a gift they’ll appreciate long-term, especially when summer rolls back around. Cost: $2.99 per cooler, plus the cost of the drinks. The tote bags say that it’s a great day for taekwondo or karate, but after a hard day of training, it’s a great time for a relaxing bath. Get a tote bag corresponding to the gift recipient’s martial art (you can line the bottom with some crinkle-cut paper shreds if you’re feeling really fancy!). Fill it with bath bombs, bubble bath, body wash, tea candles, and other goodies in a relaxing scent like lavender. Add a note about how they can create their own personal spa after a long session on the mats. Cost: $12.99 for a tote. You can find a large selection of bath goods for between $1 and $5 at most general merchandise stores. Look, as someone with an erratic sleep schedule and busy work day, I can tell you that caffeine is the best, most treasured gift one can receive, followed by snack food. Give a gift that has both! Pick up a Grip-N-Go Travel Cup (they say “Powered by Karate” or “Powered by Taekwondo,” but we can all be forgiven for supplementing that with coffee), some coffee beans, and cereal bars, and wrap them together. Voila – breakfast on the run for the hectic days after the holiday ends. If they’re not a coffee person, you can get them their favorite tea or hot chocolate mix instead of beans. Cost: $9.99 for a Travel Cup, plus the cost of the drink and snacks. This is the perfect gift for your friend who spends all their time at the gym. The best part? It comes with its own wrapping! Start with a Sling Bag. Inside, place a Taekwondo or Karate Warrior Shaker Cup. Finish off the kit with some protein powder or pre-workout drink mixes, and tie the bag shut with a ribbon! Now, a carton of protein powder or pre-workout is expensive – likely well over $25. However, many health and nutrition stores will sell single-serving drink mix packets of popular brands. These will only be a few dollars, so you can buy several. This is a great way to let the gift recipient sample various flavors and find new favorites! Cost: $8.99 for a Shaker Cup, $9.99 for a Sling Bag, plus the cost of drink mixes. In video: Steel Sport Bottles, Grip-N-Go Cups, Great Day Water Bottles, Shaker Cups, and Cooling Wraps. If there is one certain, bona fide truth in the world, it is that kids love to color. On paper, on walls, on the dog, on themselves, on their siblings – it doesn’t matter. Give them a creative outlet that won’t result in any time-outs with the Nigel the Ninja and Nigel Meets Friends coloring storybooks, plus some brand-new crayons or markers. Pro tip: crayons are less likely to result in a green-tinted German shepherd or baby brother. Walls are still fair game. Just sayin’. Cost: $2.99 per book, plus new coloring supplies. The best gifts are those that truly convey to the recipient, “You’re important to me.” Show someone that you care about the time you’ve spent with them, and the memories you have with them, with a framed picture. Taekwondo Photo Frames are great if you train with the intended gift recipient. If they’re the only trainee, fill the frame with a photo of you attending one of their tournaments, or another shared memory involving their sport. Cost: $16.99 plus the cost of printing a picture. For young kids, half the joy of getting a gift is the surprise of having a wrapped mystery item in front of them and being able to open it. 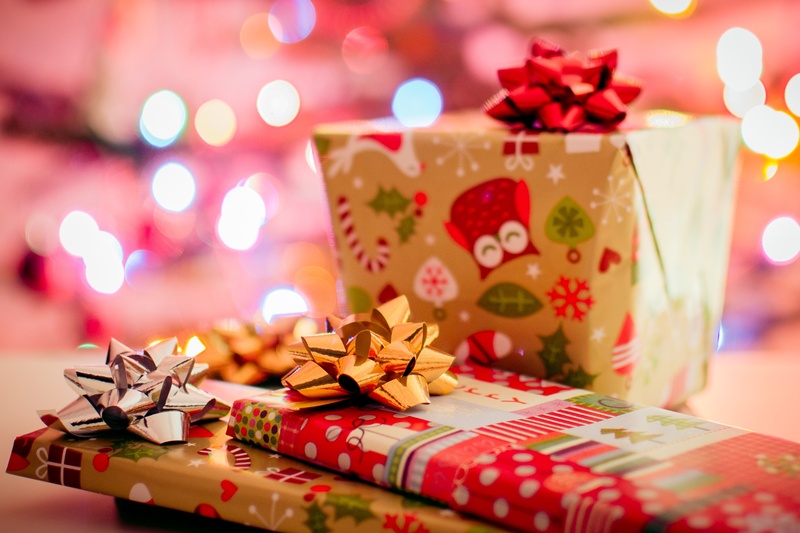 Instead of braving the shopping mall for that elusive big gift – it’s probably sold out by now, anyway – individually wrap a bunch of small items, and place them together in a gift bag. Kids will get a kick out of opening the bag and discovering that they still have even more to unwrap! Pair a few of these items with their favorite candy bar, a small toy, stickers, stickers, playing cards, silly socks, etc.